I was really excited about touring the Sam Adams brewery in suburban Boston, but unfortunately I found the experience a little disappointing. The tour started with an explanation of the history of the brewery, which was interesting. The brewery aimed to fill a gap in the market for full-flavoured, high-quality beers that had all but died out during the Prohibition era. 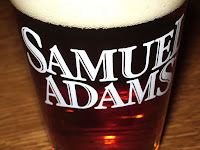 They named their brewery after Samuel Adams who was one of the major players in the Revolutionary war, a signatory on the Declaration of Independence, and a brewer by trade. We then learnt a bit about the brewing process, but this seemed a bit tokenistic because none of the real bottling is done at the boston brewery so the scale is extremely small and there are no mesmerising lines of bottles flying past. We moved quickly on to the tasting, where we had some great beers I had already tasted, and finished with the horrible cherry wheat beer. This beer tastes like someone has spilt Dr. Pepper into a perfectly good beer.